Taipei, Aug. 7 (CNA) One week after the explosions in Kaohsiung that killed 30, investigators are looking into a section of pipeline belonging to LCY Chemical Corp. that crossed a culvert -- an underground drainage passage -- which exposed the pipe to air and caused severe corrosion. Prosecutors now believe that in addition to LCY's pipe that carried propylene, other pipelines discovered running horizontally through the culvert were also responsible for the explosions. The box-shaped culvert is not listed in any official records. Pipelines are not supposed to run across it, and the ones investigators found had been left unattended and unsupervised. Prosecutors have launched investigations into who the new pipelines belong to and who in the city government should be held responsible for them. Culverts fall under the supervision of local government. 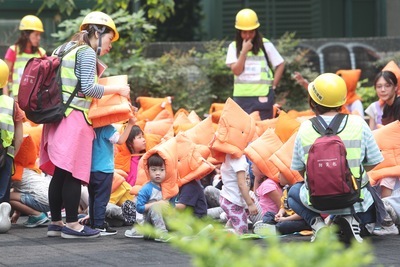 That widens the culpability of the July 31 blasts in Cianjhen and Lingya districts, which prosecutors have said the municipal government missed the chance to prevent. Although the investigation is still ongoing, the disaster is widely believed to have been caused by a leak of propylene from the LCY pipeline. Prosecutors have called in engineers and officials of the state-run oil company, CPC Corp., Taiwan, which was responsible for building the pipelines years ago. But the company has denied allegations that there were any illegal constructions or cut-corners by its contractors. "There was no such culvert when we built the pipelines. We'll wait to see what prosecutors [find] when they finish their investigation," CPC Corp., Taiwan said. Economics Minister Chang Chia-juch expressed surprise upon learning of the mystery culvert. "It was not in the blueprints, and we need to investigate further and verify why and how it is there now," he said. As pipelines are typically buried in solid ground to prevent corrosion, "putting those pipelines in the culvert is really unimaginable," he said. Kaohsiung's municipal water authority speculated that the culvert was built in 1976, when work was done on an adjoining underground waterway. The water department said it will conduct checks across the city to see if there are any other culverts with unknown pipelines running through them.